t-fal saute pan – 12″ – yeah! T-fal E93808 Professional Total Nonstick Oven Safe Thermo-Spot Heat Indicator Fry Pan / Saute Pan Dishwasher-Safe Cookware (thing), 12-Inch, Black – longest name ever – just saying. Prometal Pro nonstick interior is exceptionally durable and scratch resistant, safe for use with metal utensil – will never do that – thanks to Get it Right spatulas. 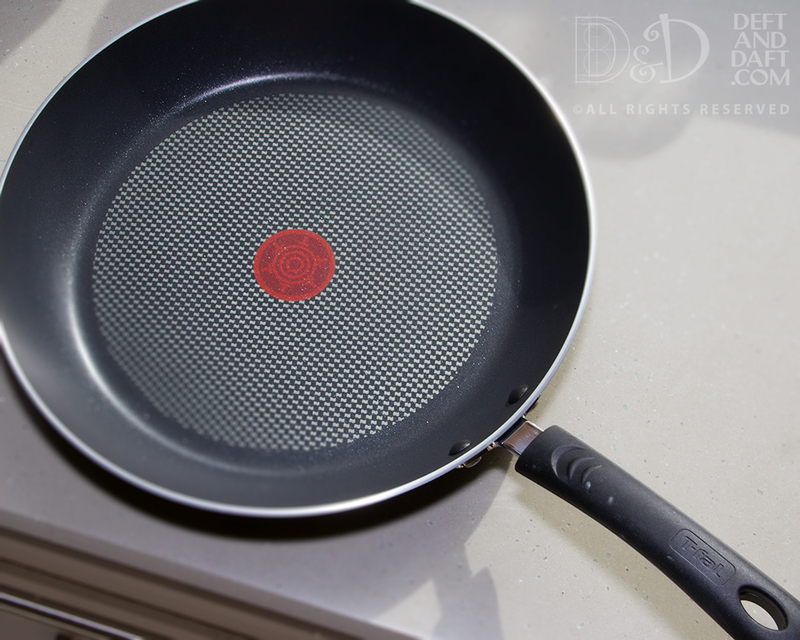 The unique T-fal Thermo-spot heat indicator shows when T-fal pan is perfectly preheated for cooking. Riveted Silicone Handles for comfort grip. Isn’t that just so cute? Not really sure what it means. I’m blonde. No, really. On Amazon, this is usually about $40, which isn’t bad for a saute pan, especially one with praise of American’s Test Kitchen. In fact, if you watch that show, or its companion, Cook’s Country, you’ll see this pan used a lot. I had it on my wishlist on Amazon and the MotH went to purchase some water filters for the refrigerator, and receive a notice that the price had dropped – to $26 – really? Super cool! So he asked and said yes (yep, this happened 13 years ago too) – no brainer there (either time). He bought it for me. And I love it. I’ve been hand washing it – that’s how much I love it. Crazy, right? *stole all the bullet points from Amazon. But snarky comments are my own – surprised? I hope not. Baking involves planning – if you want to make it easy. I love to bake. I think that is probably obvious. I learned an important lesson from my mom when it comes to this. 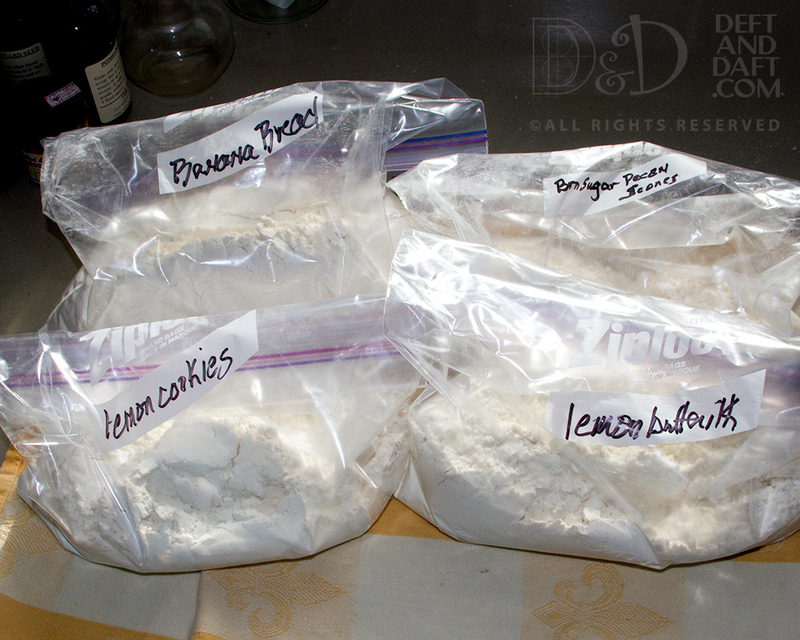 Measuring out the dry ingredients – flour, baking powder, baking soda, salt – is beyond time consuming and amazingly boring. So I use her plan to make it easy for weeknight baking which is always a pleasant surprise for the people I work with (hate ending sentence like that – see grammar nazi – thank you Bug Martini – funny and wrong at the same time – love it!). Once again, side tracked. So here, really, is how I do this. Say on the weekend, I’ve decided to make cookies or a cake, so I have to measure the dry ingredients, otherwise the recipe won’t work – Surprise! But while the recipe of my choice bakes, I pull out all the other recipes of things I’m thinking about baking and I just go ahead and measure and sift (I always sift) the dry ingredients and put them in labeled zip-top bags. Simple enough. My mom did this at the holidays because her banana nut bread was a gift to her close friends and she made an assembly line of it, but that works for any baked thing really. At some point, once you have flour on the counter, it doesn’t really matter, does it? I buy more cookbooks than I use which makes me feel bad that I don’t give each of them their due – Not enough time in the day – not enough days in a week – seasons go by so fast. I have great intentions, make lists (surprise! ), read and consider things to make, but too often I get side-tracked by another cookbook I already have, or by some random thing that I’m obsessed with making at that moment. Friggin inter web. Or something the Boy wants – don’t mind that at all. Being from south of the Mason-Dixon, born of two North Carolinians in Florida (which isn’t, if you are from NE Florida, part of the South really – too many transplants), raised on what could best be described as country food, Southern food, soul food, and poor people food, but wickedly good food, is an amazing heritage to have and one that is strangely unique. There are so many things that I remember and want to share with my family. There is also so much that I have yet to learn and didn’t learn before my mom died. That is the heart of this problem. My father’s family was from North Carolina via Georgia and my mom is also from a very small town North Carolina town – town is kind of stretch when my uncle was mayor and there is only one stop light. Her first husband was from rural North Florida which I think influenced her NC cooking because my mom spent lots of time with her lovely in-laws, who I was blessed to know, but briefly. I think there are so many Southern recipes that have moved around the south and you see slight variations from all your family and friends (and their families). Sausage balls, creamed beef on toast, collards and cornbread, tomato gravy over rice, country fried steaks, real mac n cheese, sweet potato casserole with lots of pecans – this could just go on forever. Not to mention boiled peanuts – can’t wait for fall for the biggest and best green peanuts from Jay, Fl. Totally forgot about hoe cakes – damn. Now if I could only find a recipe for pork ‘n bean salad with celery and onions. ** Guess I need to start looking at church cookbooks. This feels like an odd kind of manifesto. Maybe it is. *Think bisquick and condensed soups, especially condensed soups – ugh. **I do want this recipe, but somehow I have the strange feeling it won’t measure up to my memory of it. I do think memories work that way and maybe it’s best to leave things alone. Who is to say? I know I said back in the bleak winter of January that I would order a black spatula next. But then we went through spring and this summer I finally got around to ordering my third spatula and I just couldn’t help myself … I stayed in the citrus colors that I started with – lemon, lime, and now orange. I did change up models though. I am now the proud owner of an orange skinny Get it Right spatula. Which meant the demise of one of my inferior spatulas – good riddance puny weak spatula. 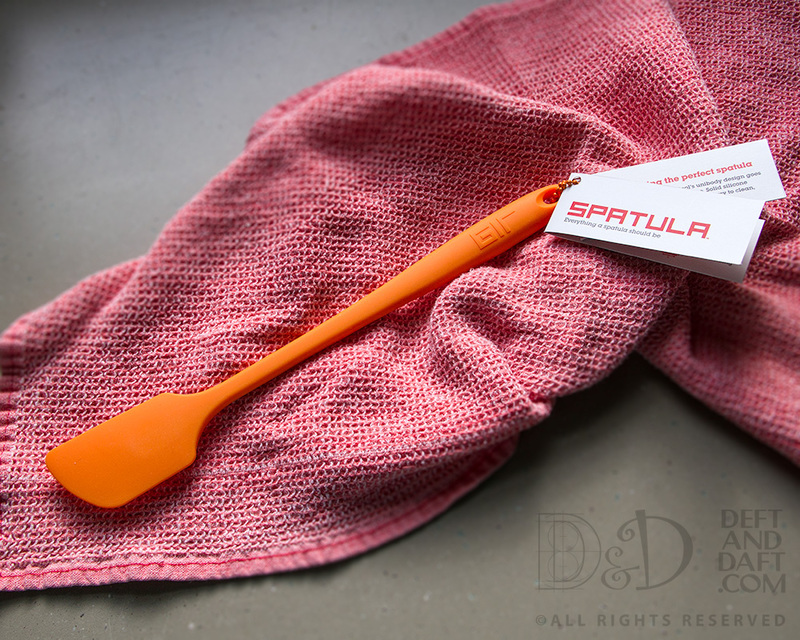 I know it sounds weird to wax poetic about a spatula, but these are amazing. They hold up well to everything I’ve dished out at them, seem almost indestructible, and clean up easy in the dish washer (no worry about melting). If that were not enough, they are super reasonably priced. I’ve told my friends about them. I know what you’re thinking – only a strange person would do that. But my friends know I’m a kitchen nerd, so this comes as no great surprise to them. Just wondering what color to order next … guess it depends on the time of year. We were not a potato family growing up – that’s not to say we didn’t eat potatoes at all, but at any given meal, the starch of choice was rice. So, therefore, while I do love hash browns and home fries, I am not a huge fan of french fries, and definitely not of mashed potatoes. So, I in turn, don’t turn to potatoes all that often (potato salad excepting – there will more on that shortly). Latkes are a part of my Christmas tradition and I love a good corned beef hash w/onions and potatoes, but my repertoire is not very extensive. The same holds true for pies. The only pie my mom made, as far as I can remember, was pecan pie for me for my birthday – that was my birthday “cake.” I don’t remember a single apple or berry pie from my childhood at all. No pumpkin or sweet potato either. Therefore the only pie I make on a regular basis is a pecan pie. I do make an occasional lemon curd tart thanks to an excellent recipe from the original (1992) Martha Stewart’s Pies and Tarts cookbook. * But I think it is past time to remedy this situation. But then the question arises – how to do this when there are only three of us? And of those three, one who does not care for sweets, no less. Whole pies don’t make sense for just three people – at least not in my head they don’t. Is there a way of making smaller – individual pies? Well, I did a little research and there is – I just purchased a 6″ glass pie dish from Williams-Sonoma. While I wait on the delivery, I will have time to decide how to down size recipes for pies that I want to try. Math is not my strong suit. Sigh. What better time to start a round of individual pies than summer – and my first project will be a blueberry cream cheese pie. Blueberries are super inexpensive right now and I can get locally grown ones too — all the better. * Amazingly good lemon curd recipe! There are many excellent recipes in this book and I will be getting more than just the lemon curd and green tomato pie sections messy in the near future. The pictures are amazing – esp. the one of curds made from store bought eggs vs. fresh farm eggs. Need to find an egg source here that isn’t too far away. There is no such thing as too many lemon cookies or varieties of lemon cookies to try. I’m hard pressed to think of any lemon cookie that I wouldn’t try. I don’t get distracted often with other cookies, unless the Boy wants something in particular, so I guess that helps. These are a Martha Stewart recipe that I had not tried before. They are excellent sugar cookies, but I really could have gone for more lemon flavor. I made the smaller than called for because I don’t care for really big cookies – they do spread so keep that in mind when spacing them. They are crisp and are very light. Loved them, but would like more lemon. But maybe that’s just me. 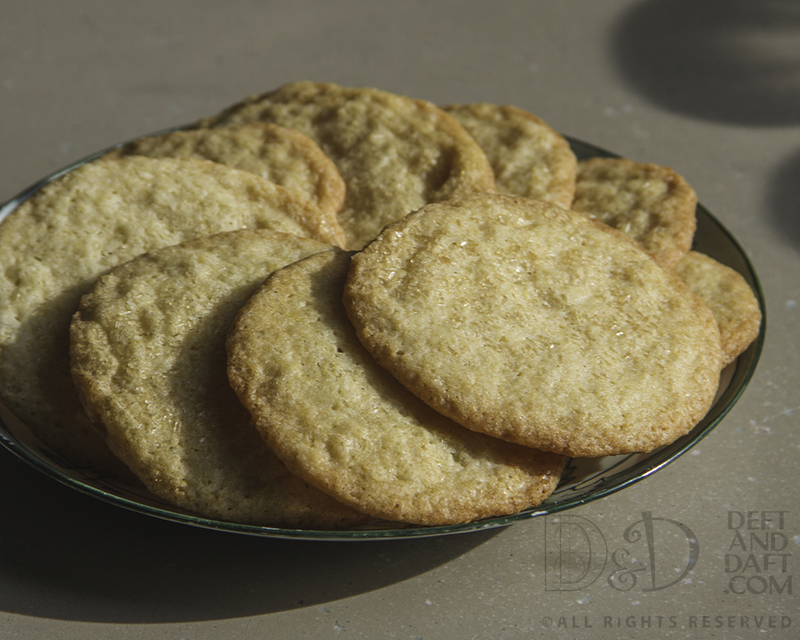 14 July 2015 – made smaller cookies, 10 minutes at 350 degrees.